The AP70 Mk2 is a dedicated autopilot controller designed to meet the needs of professional mariners aboard a variety of commercial vessels. Replacing both the AP70 and AP80 as our IMO/SOLAS autopilot controller, the AP70 Mk2 retains much of the well-reputed platform of its predecessors, but with a brilliant new display and modernised software interface. The AP70 Mk2 accommodates installations with up to six drives. Previously only available with the AP80, this premium feature is now a standard in the AP70 Mk2. Engineered for responsiveness, robustness and ease of use, the AP70Mk2 pairs a precision rotary control dial with dedicated buttons for instant access to steering modes, several custom-configurable work modes and multiple rudder/thruster integration. 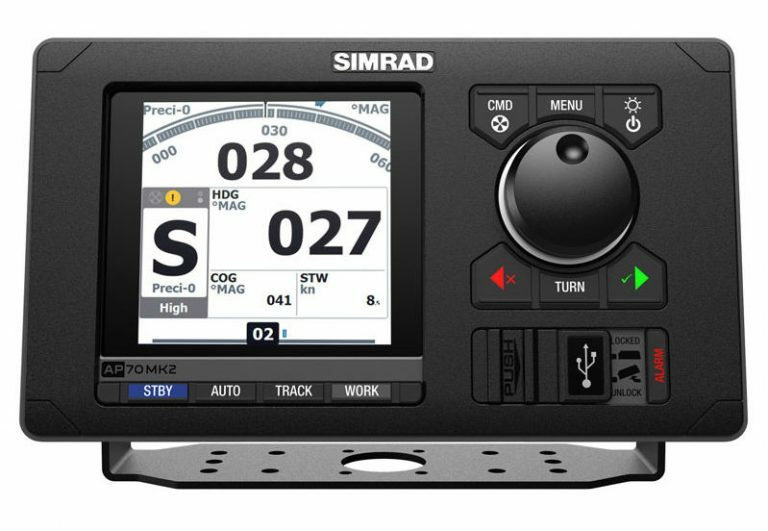 The AP70 Mk2 builds on, and continues the legacy of the SIMRAD Pro autopilot product portfolio. Its performance, robustness and quality are proven and recognised with the wheelmark symbol, making it suitable for all vessels ranging from small work- boats to large tankers. Parameters ranges and tuning options to support vessel dynamics. Adjustable for all weather conditions, hull types, work situations. Suitable for retro-fit on old ships as well as modern new-builds. Water jet, Azi-pods, Voith-Schneider, Rudder, outboard. Control signals to control, hydraulic pumps, solenoids, analog current/voltage, control/handshake signals. Dual rudders, fore and aft thrusters supports large and complex installations and redundancy. Simrad heavy-duty rudder feedbacks are supported. Autopilot settings can be tuned for optimal performance in separate low-speed, high-speed, and Work modes. The user-configurable Work mode allows the autopilot system to be configured for optimal response in a specific situation, such as a fully laden vessel, configurable thruster usage. No Drift mode integrates GPS navigation with auto-steering, using position data to counteract the effects of wind and tide. This allows the AP70 Mk2 to maintain a straight track over ground on the current course, without the need to manually set a waypoint or route. Navigation steering controls the ship on a pre-planned route from a Simrad MFD, Simrad ECDIS or third party MFD and ECDIS. Command transfer is a mechanism useful in multi-controller installations. It enables the officer on watch to allow, deny the transfer of autopilot control to control devices such as a secondary AP70 Mk2 or a remote controller on a bridge wing station, above deck, or aft bridge depending on the work scenario. The AP70 Mk2 can also be used in an open configuration, where control flow is unrestricted.